This year marks the 5th anniversary of one of the most noble ventures of recent times, IDIA (Increasing Diversity by Increasing Access to Legal Education), the pan India movement to train underprivileged students and facilitate access to premier legal education. Marking five years of constant commitment to the cause, IDIA is organizing a two day event on 2nd and 3rd of October in Delhi. The title theme of the joint conference between IDIA and NLU, Delhi to be held on 2nd of October, is “Gandhi and the IDIA of Law: Creating Champs”. The session will be held at National Law University, Dwarka. Justice Zak Yacoob, renowned jurist and former judge of the South African Constitutional Court, will be delivering the keynote speech. The conference will focus on each one of the CHAMPS attributes (Creative, Holistic, Altruistic, Maverick and Moral Problem Solvers) and what the present day profession thinks of them. The event on the 3rd of October will be held at the Delhi Flying Club, Safdarjung Airport, and will begin around 5 pm. This event will continue with the theme of creating CHAMPS. It will also be an IDIA fund raising and awards ceremony and will be attended by leading lawyers from Delhi, leading judges and various other luminaries from industry and the social sector. Padma Shri Dr. N.R. Madhava Menon will be delivering the keynote address. IDIA students and underprivileged scholars will be present for the event. 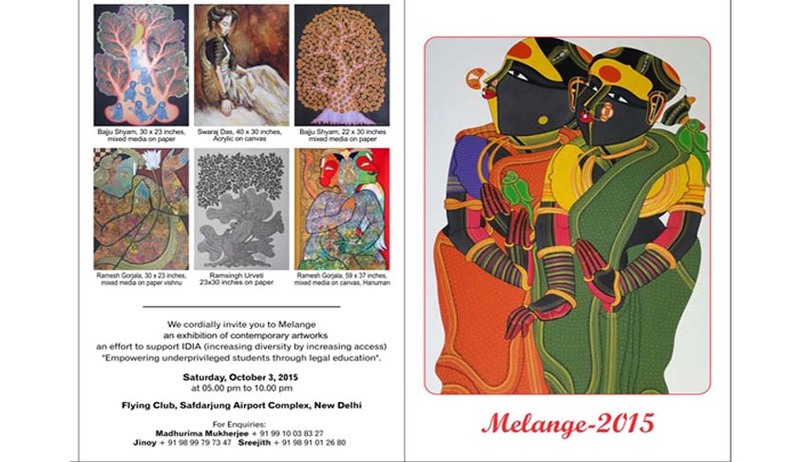 Additionally, the evening will also feature ‘Melange’, an exhibition of contemporary artworks by renowned artists such as T. Vaikuntam, Ramesh Gorjala, Laxman Aelay, Shyamal Mukherjee, Murali Nagapuzha, Sachin Karat, Sanjay Soni, Bajju Shyam, Manikandan Punnakkal, Pramod M.V., and H.R. Das, along with photographs captured by IDIA scholars Donnie Ashok and Vipan Kumar. These works will be available for sale, part of the proceeds of which will go towards IDIA. The movement started off under the leadership of Professor Shamnad Basheer of the West Bengal National University of Juridical Sciences (NUJS) as a movement to eliminate the inequities of education. IDIA then geared up to question and change the statistics which portrayed a lack of diversity in the National Law Schools, with most students belonging to the upper middle socio economic class bracket. It then set up Local Chapters in different parts of the country. These local chapters conduct aptitude tests and initiate intensive training programme for those who did well, and those who are interested in pursuing law as a career. Once selected to the top law schools, IDIA arranges for sponsorships/scholarships and mentorship schemes to help candidates blossom to their full potential and take their rightful places as leading lawyers and community advocates. The CHAMPS project was piloted just a few months ago where IDIA scholars, along with IDIA volunteers, members of legal aid cells of law schools, and legal professionals visited the locale of one of IDIA’s scholars, identified specific problems faced by their communities and examined the extent to which law could help resolve some of those issues. For more information on the CHAMPS project please visit IDIA CHAMPS website page here. LiveLaw had conducted an interview with Ms. Yamuna Menon, an IDIA scholar who secured 30th rank in CLAT, 2015. You may read the Interview here.